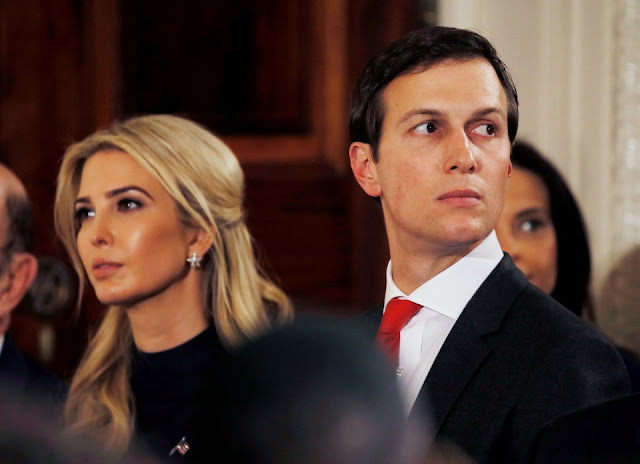 I'm glad to see people noticing that Ivanka Trump is not a "moderating influence" in the White House (she shouldn't even *be* there), and that her husband, Jared Kushner, is probably more dunce than genius (he shouldn't be in the WH either). That there has not been greater inquiry into her financial dealings and foreign ties speaks to a normalization of abuse of executive power, possibly because trading policy for handbags seems less threatening than Trump’s many other misdeeds. But the Trump family businesses should be scrutinized all the same. Trump did not drain the swamp; he merely made it into a moat that protects his family. At the center of this protective measure is Jared, who when not doing his alleged job of Absolutely Everything, serves as a chess piece in the Trump administration’s media games, a pawn ready to be turned king. Are there ever going to be any consequences to any of this?